While teaching the Numerical Methods for Engineers course over the last 15 years, the author found a need for a new textbook, one that was less elementary, provided applications and problems better suited for chemical engineers, and contained instruction in Visual Basic® for Applications (VBA). This led to six years of developing teaching notes that have been enhanced to create the current textbook, Numerical Methods for Chemical Engineers Using Excel®, VBA, and MATLAB®. Focusing on Excel gives the advantage of it being generally available, since it is present on every computer—PC and Mac—that has Microsoft Office installed. The VBA programming environment comes with Excel and greatly enhances the capabilities of Excel spreadsheets. While there is no perfect programming system, teaching this combination offers knowledge in a widely available program that is commonly used (Excel) as well as a popular academic software package (MATLAB). Chapters cover nonlinear equations, Visual Basic, linear algebra, ordinary differential equations, regression analysis, partial differential equations, and mathematical programming methods. 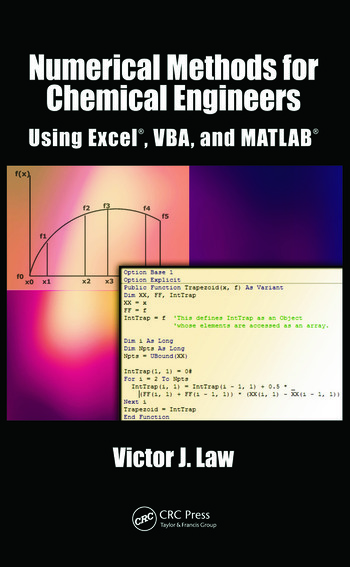 Each chapter contains examples that show in detail how a particular numerical method or programming methodology can be implemented in Excel and/or VBA (or MATLAB in chapter 10). 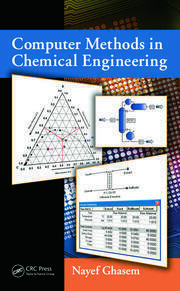 Most of the examples and problems presented in the text are related to chemical and biomolecular engineering and cover a broad range of application areas including thermodynamics, fluid flow, heat transfer, mass transfer, reaction kinetics, reactor design, process design, and process control. The chapters feature "Did You Know" boxes, used to remind readers of Excel features. They also contain end-of-chapter exercises, with solutions provided. How Good Is the Fit from a Statistical Perspective? Victor J. Law, Ph.D., FAIChE, FIChemE, CE, initiated a program that was to become the Department of Computer Science at Tulane. During his tenure in computer science, he wrote two textbooks on introductory computer programming. In 1988, Dr. Law returned to the Chemical Engineering Department in order to resume his research career. He has taught classes in process control, transport phenomena, process design, engineering statistics, and numerical methods for chemical engineers. His research has included projects in coastal erosion, methane emissions from rice paddies, thermochemical processes for hydrogen production from water, and butanol production from biomass. Dr. Law is a Fellow of the American Institute of Chemical Engineers; a Fellow of the Institution of Chemical Engineers; a Chartered Engineer in the United Kingdom and Europe; and a Registered Professional Engineer, State of Louisiana.